Recently I got some Avery brand printable fabric *. At 3 dollars a sheet, it's less expensive to do iron on transfers or iron fabric to freezer paper and print it that way for a lot of uses. What it IS good for isn't really one of the project ideas listed on the package. Iron on patches. This stuff has iron on adhesive on the back, is fairly stiff, and can be punched with craft punches. You can make cool band patches, or peace symbols or other things. Save it for stuff you'll hand wash. I'm not sure how it will hold up in the washer. This is actually what I'll use it for. My 62 year old dad would rather have me repair a small hole in a jacket than replace the jacket, but he's terribly picky about patches. He wants either patches that match the fabric, or he wants something cool. I was spending a couple dollars each on little skulls and such for his jackets when I found some that were the right size. With this, and a one inch circle punch, I can make a bunch of little circle patches that he'll like. So to test it, I printed a sheet of well, fairly random things. Some of it is meant for other projects, but the sheet included a bunch of 1 inch and 2 inch circle designs like the one above. 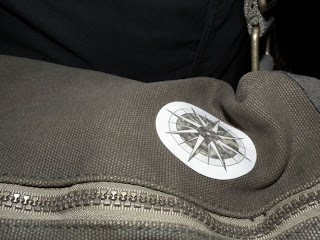 That's one of my compass rose designs . Then I punched it using my handy dandy 2 inch circle punch, and ironed it on to my son's messenger bag. As you can see, it punched very cleanly and seems strongly adhered. Anyway, all that to say.. here's the designs I used for some of the patches. I didn't format them to print on a full sheet, but you can get 12 2 inch circles from one 8.5x11 inch sheet of paper. Click on the images for the full sized 300 ppi PNG images. You don't have to use these for iron-ons, they can be used as stickers for scrapbooks or whatever crafty use you have in mind. * Amazon.com affiliate links help pay for this site and support my book addiction.